Giraffe Childcare first opened its doors in its IFSC crèche in 2001 and has been caring for many children and their families for 17 years. It is Irish owned and has 21 settings in the greater Dublin area that are an integral part of the communities which they serve and support. We know that your peace of mind is paramount and we offer a fully transparent, safe, nurturing and secure environment for your child. In cooperation with a number of state bodies, Giraffe Childcare conforms fully with all the relevant state guidelines. We work closely with Tusla, the dedicated Child and Family Agency responsible for the regulation and inspection of all early years settings to ensure that high quality childcare services are delivered to children and families. Siolta has been developed on behalf of the department of education by the Centre for Early Childhood Development and Education. Siolta defines, assesses and supports the improvement of quality practice in Early Childhood Care and Education (ECCE) settings where children aged birth to six years are present. At Giraffe, we work within the quality framework and ensure that all our settings strive to meet these quality standards. All our crèches fully comply with Children First, the national guidelines for the protection and welfare of children. In addition, all our staff undergo an initial training period and attend ongoing refresher courses to keep abreast of evolving child protection policies, procedures and best practice. Our crèches are participating in the Better Start quality programme which was launched by the Department of Children and Youth Affairs in consultation with the Department of Education and Skills to promote and enhance the quality of early childhood care and education for children from birth to six years in Ireland. Working closely with our parents and the advisors on the programme, we have had some wonderful feedback on our practice which is very rewarding for our staff teams and parents. Some of the feedback is on display on the our parent noticeboards in our crèches. Giraffe is participating in the Healthy Ireland Award Smart Start programme. 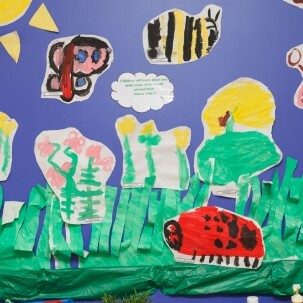 Smart Start is a Pre-school Health Promotion training programme led by the HSE, in partnership with Healthy Ireland and the National Childhood Network, which ensures children in the pre-school settings are supported to adopt healthy lifestyle behaviours in early childhood. The aim is to bring all people together into a national movement with a single aim to ensure the best possible health and well-being of our nation. Giraffe’s own REACH curriculum encourages children in our care to become confident and independent learners that marvel, value, and respect their world. Our REACH curriculum is built on a philosophy of engaging with children’s natural energy and curiosity to promote their learning and development. Children enjoy indoor and outdoor play activities which meet with their evolving abilities during this period of rapid and exciting development. Central to our ethos is our belief that learning should be playful and that our task as educators is to provide diverse and exciting learning opportunities for your child’s enjoyment and development. Why not drop in and see for yourself? Contact us on (01) 2450935 to arrange a visit. We wanted to say a HUGE THANK YOU for all the love and care that you have given Leah over the past 3 and half years. I can’t believe how quickly it’s flown by in the end. She started before she was even crawling and now she has an answer for everything! The range of activities she experienced was excellent and I was always impressed with the daily reports and updates.